How to determine whether you are getting a fair deal? With the gold price making periodic new highs and the economy suffering, more and more people are rummaging through the jewelry box for ways to raise extra cash. How can you determine whether the price you are offered represents a fair deal? With a few simple tools and a little bit of investigation, you can arm yourself with better information BEFORE you go on your gold selling quest. An educated consumer is a savvy consumer, so this is the best way to make sure you get the right price. You will need to acquire a magnifying glass, a sensitive scale capable of measuring in grams (such as a decent kitchen scale), a calculator or computer, and your old gold jewelry. Using your magnifying glass, determine the karat weight (10k, 14k, 18k, 22k, etc.) by looking for hallmarks on the individual jewelry pieces. The hallmark can be anywhere, but is typically on the clasp of a bracelet, chain or necklace; on the inside of a ring; on the post of an earring; and so forth. Separate your jewelry into different piles sorted by the different karat weights, or purity. Add all the new totals together. This is how much pure gold (in grams) you have. Determine the current gold price by checking a site such as www.kitco.com or www.goldprice.org. Divide the current price by 31.1 to determine the Spot Price Per Gram. Multiply the Spot Price Per Gram x your total pure gold (from Step 3). This is the Full Spot Market Value of your gold jewelry. If gold selling were just about finding someone to buy your gold, it would be much easier, but you also want to find the right price. Make sure you follow the above steps as near to the day on which you plan to sell your gold as possible. When offered a price, compare it to the value you have already determined. 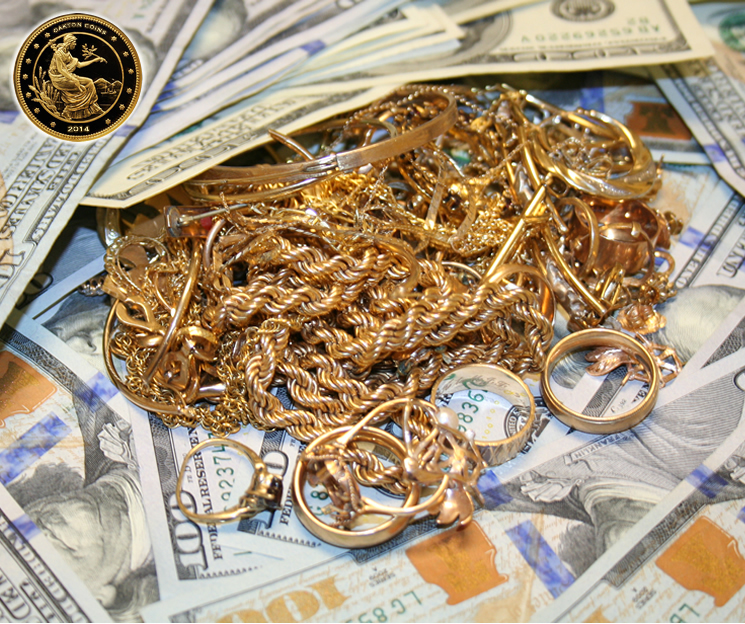 Gold buyers have to cover their costs, which include refining or melting the jewelry they buy, marketing and promotion, equipment, rents and administration. For very small amounts of gold, you can expect to receive 40-50% less than the Full Spot Market Value. For larger amounts of gold, you can expect to receive just 10-20% less. 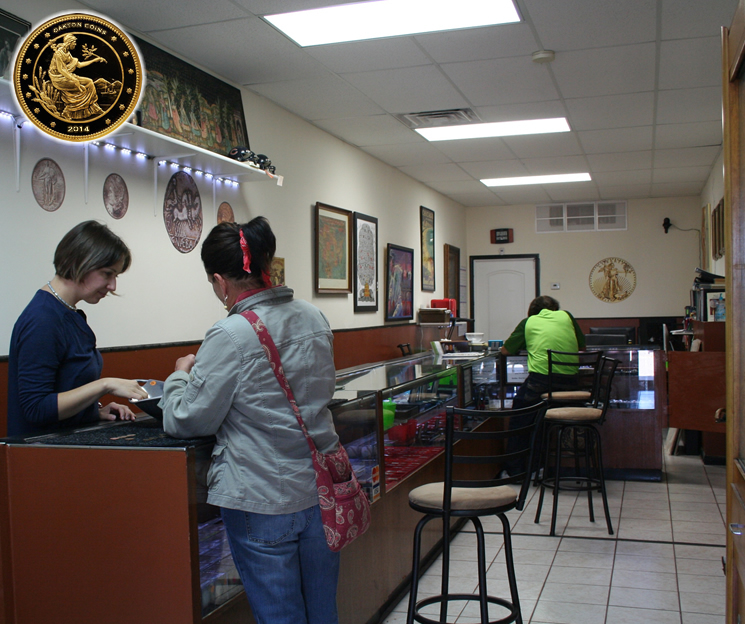 This entry was posted in Uncategorized and tagged 10k gold, 14k gold, 5 Steps to Successful Gold Selling Chicago, best place to sell, chicago, chicago coin shop, Chicago gold buyers, coin shop, current gold price, Des Plaines, diamonds, evanston, fast, Glenview, gold, Jewelry, Kenilworth, kitco, kitco.com, lincolnwood, loop, money, Morton Grove, Niles, Oakton Coins & Collectibles, Park Ridge, purple line, rogers park, sell, Sell antiques, Sell broken gold, Sell class rings, sell coins chicago, Sell dental gold, Sell designer jewelry, Sell estate jewelry, Sell Gold, Sell gold bracelets, Sell gold bullion, sell gold chicago, Sell gold coins, Sell gold lighters, Sell gold necklaces, Sell gold watches, Sell junk gold, Sell luxury watches, Sell platinum, Sell scrap gold in Chicago, Sell scrap gold watches, Sell Silver, Sell silver candlesticks, Sell silver coins, Sell silverware, Sell wedding rings, silver, skokie, skokie antique appraisal, Winnetka, yellow line on October 28, 2013 by sell gold chicago. Here’s a list of items that you can usually sell Don’t see your item? Call us or bring it into one of our locations. If your item has value, we can usually buy it from you. This entry was posted in Uncategorized and tagged 10k gold, 14k gold, 18k gold, 5 Steps to Successful Gold Selling Chicago, 925, best place to sell, chicago, chicago coin shop, Chicago gold buyers, coin shop, current gold price, Des Plaines, diamonds, evanston, fast, Glenview, gold, Jewelry, Kenilworth, kitco, kitco.com, lincolnwood, loop, money, Morton Grove, Niles, oakton coins, Oakton Coins & Collectibles, Park Ridge, purple line, rogers park, sell, Sell antiques, Sell broken gold, Sell class rings, sell coins chicago, Sell dental gold, Sell designer jewelry, Sell estate jewelry, Sell Gold, Sell gold bracelets, Sell gold bullion, sell gold chicago, Sell gold coins, Sell gold lighters, Sell gold necklaces, Sell gold watches, Sell junk gold, Sell luxury watches, Sell platinum, Sell scrap gold in Chicago, Sell scrap gold watches, Sell Silver, Sell silver candlesticks, Sell silver coins, Sell silverware, Sell wedding rings, silver, skokie, skokie antique appraisal, Winnetka, yellow line on September 16, 2013 by sell gold chicago.